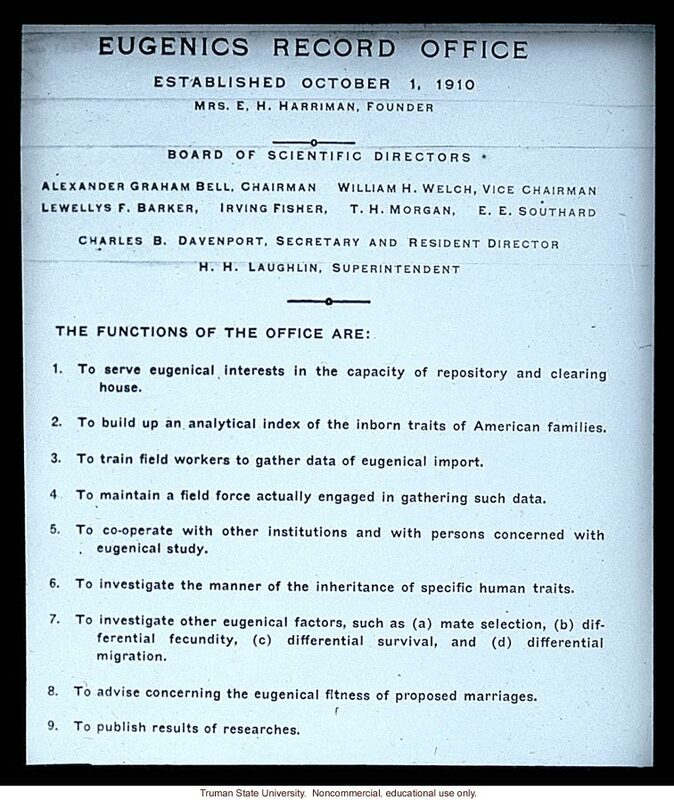 Eugenics Record Office Established October 1, 1910 Mrs. E. H. Harriman, Founder Board of Scientific Directors Alexander Graham Bell, Chairman William H. Welch, Vice Chairman Lewellys F. Barker, Irving Fisher, T. H. Morgan, E. E. Southard Charles B. Davenport, Secretary and Resident Director H. H. Laughlin, Superintendent The Functions of the Office are: 1. To serve eugenical interests in the capacity of repository and clearing house. 2. To build up an analytical index of the inborn traits of American families. 3. To train field workers to gather data of eugenical import. 4. To maintain a field force actually engaged in gathering such data. 5. To co-operate with other institutions and with persons concerned with eugenical study. 6. To investigate the manner of the inheritance of specific human traits. 7. To investigate other eugenical factors, such as (a) mate selection, (b) differential fecundity, ( c) differential survival, and (d) differential migration. 8. To advise concerning the eugenical fitness of proposed marriages. 9. To publish results of researches.